Send Text Messages to all attendees at the same time. Send Text Messages to all Invitees at the same time. Send Text Messages to a determined custom list (Attendees/Invitees). Send push messages to custom lists. After this, click in SMS in the left menu, select “All Attendees”, then on +NEW SMS, type your message and press SEND. All your attendees will receive this message. Follow the same steps described above, but instead choose “All invited”. All your Invitees / Attendees will receive a SMS after you complete the steps above. Telephone numbers can be collected or edited using invitees spreadsheets, can be directly added at the participants list or can be added directly by the attendee through the app. To add a telephone number, PEOPLE > ATTENDEES > EDIT > Click on the Person you wish to add a number > ADD TELEPHONE. Will the attendee be able to add / edit his phone number using the app? 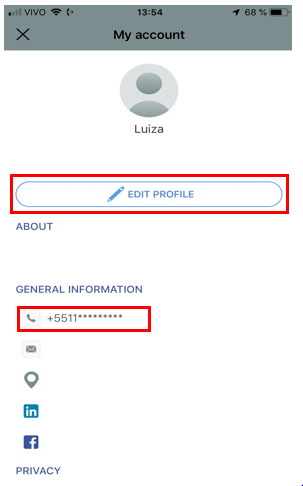 Yes, the attendee can add or edit his phone number through the app. They must be logged in at the app and event to do so. They should click in MENU and click at their name at the top. It is possible to send a SMS to a specific list. To learn more about Custom List, click here. Can I send push messages to custom lists? Yes, you can. 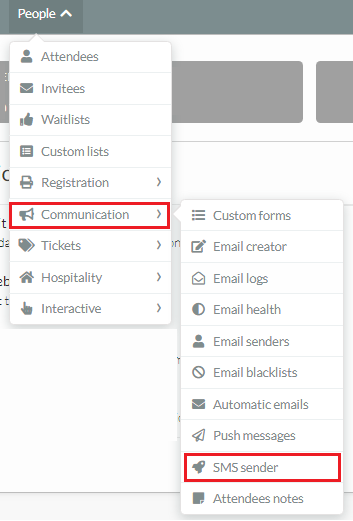 To send push messages to a custom list, select the list you want to send the message to on the dropdown menu on the left side, click on SEND PUSH, type the message and press SEND MESSAGE. Note: When sending push messages up to 140 characters, do not use special characters such as: “”, ‘ , \.